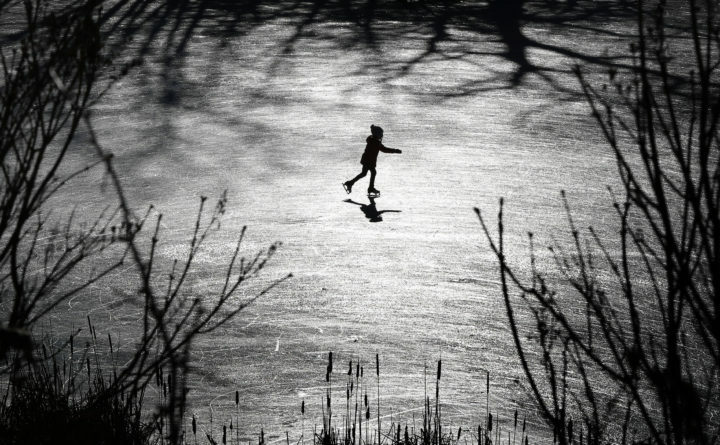 A girl skates across a frozen pond, Wednesday, Dec. 26, 2018, in Freeport, Maine. Maine was hit with a New Year's storm that resulted in precipitation in much of the state. Maine ushered in 2019 with a winter storm that made travel dicey early New Year’s Day, with conditions improving throughout the day in much of the state. An expected snowfall map for New Year's Day 2019 issued by the National Weather Service. Northern Maine will be hardest hit, with 7 to 8 inches of snow predicted throughout Aroostook County by the end of the storm. 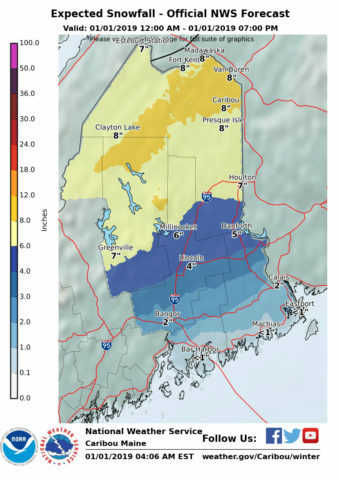 Moving south, the predicted accumulation quickly tapers off and turns to a wintery mix of rain, snow and sleet, with 6 inches of accumulation predicted in Millinocket, 4 inches in Lincoln, 2 inches in Bangor and less than 1 inch along the coast. 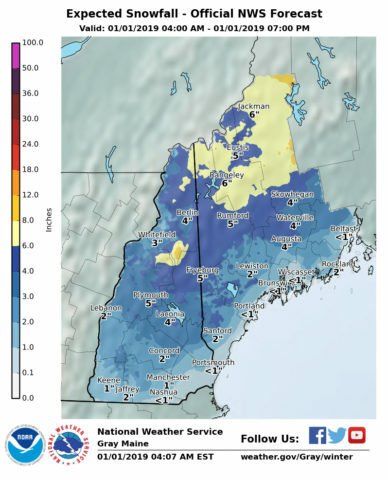 To the west, the pattern is similar, according to the NWS forecast center in Gray, with 6 inches of snowfall expected in Rangeley, 4 inches in Augusta, 2 inches in Lewiston and less than an inch in Portland. “There’s also some stronger winds down in the coastal areas, too, that may be a factor as far as power outages go,” Mignone said. Shortly after 9:30 a.m. Tuesday, Central Maine Power was reporting roughly 2,500 customers without power. At the same time, Emera Maine listed 208 customers without electricity. In Portland, NWS issued a wind advisory for gusts as high as 50 miles per hour throughout southern Maine until 3 p.m. on New Year’s Day. The strength of the wind could break tree limbs and down trees. For the New Year’s Day forecast, rain is predicted in Bangor, mainly before noon, according to NWS. The wet weather is then predicted to give way to clouds, then sun, with a high near 42 degrees Fahrenheit and wind gusts as high as 29 mph. In southern Maine, the forecast is similar but slightly warmer, with the rain ending by mid-morning and strong winds throughout the day. And a stormier day is predicted for northern Maine, with a mix of rain, snow and sleet into the early afternoon and chances of patchy snowfall into the night. The predicted high is 35 degrees Fahrenheit. Wednesday’s NWS forecast is sunny and cold throughout the state. In northern Maine, high temperatures are expected to be in the low teens, with wind chill values as low as -15. The Bangor area is predicted to be slightly warmer, with a wind chill value as low as -5. And moving down the coast, the temperatures are predicted to climb to the high 20s in southern Maine.